You will require a valid Ontario Health Card for your diagnostic visit. If you do not have an Ontario Health Card, we can accept payment via cash or cheque only. You will also require a signed requisition from your doctor. If you notice it is not signed, please contact your doctor before coming in for your exam. We cannot perform an exam without a valid signature. Before undergoing certain procedures you may be required to follow a set of special instructions. If these instructions are not followed, it may not be possible to conduct the examination and you may be required to book a new appointment. 1.Nothing by mouth 12 hours prior to exm. 2.If you have essential medication that must be taken, a small amount of water is permitted. (i) If you are asked to miss breakfast, take 1/2 your normal dose of insulin. (ii)If you have to miss any other meals contact your doctor for instructions. (iii)Resume your normal diet following the exam. 1.Empty your bladder completely and drink 2 500mL bottles of water. 2.Finish drinking the water 1 hour prior to the exam. Do Not empty your bladder. 2.Empty your bladder completely and drink 2 500mL bottles of water. 3.Finish drinking the water 1 hour prior to the exam. Do Not empty your bladder. 1.Purchase a Fleet Enema from the pharmacy. 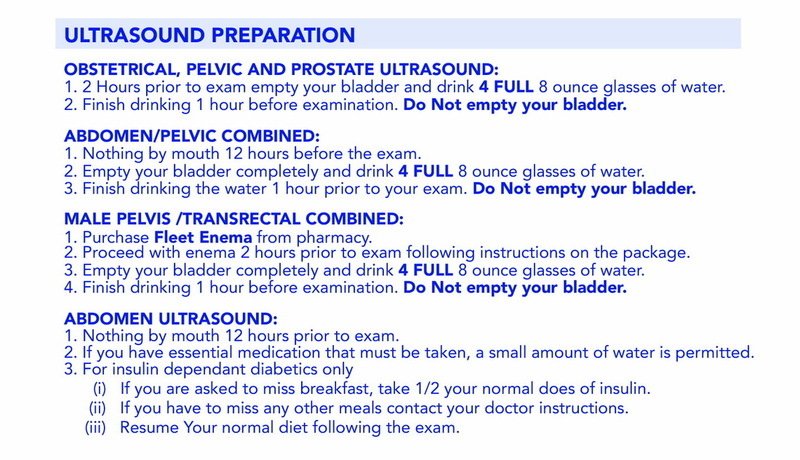 2.Proceed with the enema 2 hours prior to exam, following the instructions on the package. 3.Empty your bladder completely and drink 2 500mL bottles of water. 4.Finish drinking the water 1 hour before the exam. Do Not empty your bladder. You are also very welcome to contact us if you have any questions. We invite and welcome new clients. Our staff extends every effort with the comfort of our clients in mind.